View More In Small Pastry Molds. 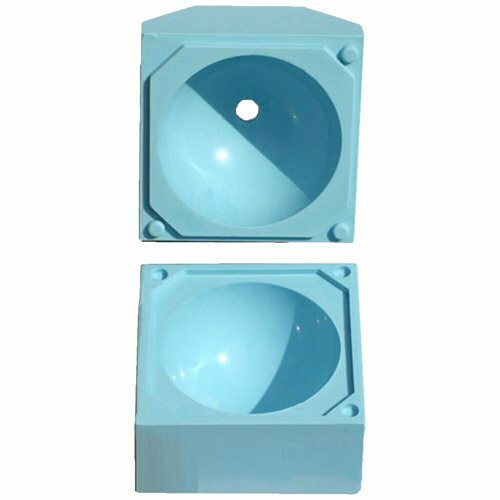 Add the jumbo 4diameter sphere mold to your collection. Use both halves of the moldtogether or one half separately. This sphere is large enough to use with inclusions. (An inclusion is another silicone shape that is temporarily placed on the insideof the sphere mold.) Put an inclusion in this mold, cast, and then remove it toexpose a decorative, negative impression in the sphere casting of sugar orchocolate.This mold makes one 4 diameter sphere. Perfect for amenities andshowpieces. When banded together, this specially designed two-part spheremold registers so tightly together that only the smallest seam line isvisible. The two-part mold design allows the user to have open access to theinterior of the mold for encapsulation or casting perfect half-spheres. The moldhas 1 subcompartment allowing the user to cast half-spheres with a square plateattached to it. A half-sphere with a plate is great for posting beneath ashowpiece base or to provide a little extra sugar mass (corners) for pulling ashape off the half-sphere. The possibilities are endlessHelpful Hint: This mold holds a large volume of sugar and will hold theheat due to the insulating properties of the silicone. Be sure to let the the sugarcool as much as possible before you pour it, in order to prevent the sugar from continuing to boil insidethe mold.Safety Hint: It is critical for the user to band the mold togethertightly to prevent it from accidentally separating during use. (Wide rubberbands included.) Made of food contact silicone. Wash before use. Do not heatabove 300 F / 148 C.
If you have any questions about this product by Chicago School, contact us by completing and submitting the form below. If you are looking for a specif part number, please include it with your message.